Today was our EMHC annual meeting and mini retreat. The emphasis was on the Real Presence and how we as Extraordinary Ministers of Holy Communion should, by our example, teach others that Jesus is really present, Body, Blood, Soul and Divinity. Which brings me to this post about improving the Liturgy. I happened to come across an ARTICLE by Arlene Oost-Zinner and Jeffrey Tucker, which to me, made a lot of sense. I will post the main points but be sure to read the entire article. "Boredom during the liturgy is something all Catholics have felt from time to time, and it’s never justifiable. No matter how mundane the architecture, how dull the homily, or how bad the music, what’s taking place on the altar is a miraculous sacrifice that gives us the grace for salvation. That reality should be enough to keep our attention..."
"...There are, however, ways to break with routine and inspire steadfastness and personal attachment to the liturgy. What follows are 14 very simple steps for repairing the weaknesses that mar many U.S. Catholic liturgies. Professional liturgists resist them because of the prevailing bias against anything that smacks of a pre–Vatican II sensibility. Nonetheless, the following suggestions are born of experience and a conviction that the first aim of liturgy is to aid inner reflection. The suggestions below are simple and costless. They need not be implemented all at once. Small changes week by week will make a huge difference over time." 2. Chant for a prelude. 4. Choose plain, traditional hymns for the processional. 6. Choose a plainer Gloria. 8. The Offertory should be a time of preparation. 10. Shorten the Sign of Peace. 11. Begin the communion chant (a simple Latin hymn will do) after the priest receives. 12. Don’t force people to sing during communion. 13. 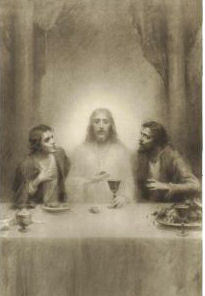 Allow for silence after communion. 14. Don’t attempt a rousing good-bye. VATICAN CITY, OCT. 8, 2006 (Zenit.org).- The world needs families that go against the current of cultural fashions inspired by hedonism and relativism, says Benedict XVI. Before reciting the midday Angelus from the window of his study today, with thousands of people gathered in St. Peter's Square, the Pope also appealed to leaders of public life to support the family. The topic chosen by the Holy Father for his address was inspired by the Gospel passage of the day's liturgy, in which Jesus gives his vision on indissoluble marriage: "What God has joined together, no human being must separate." "May Christian spouses, aware of the grace received, build a family open to life and capable of facing together the numerous and complicated challenges of our time," exhorted Benedict XVI. "Their testimony is particularly necessary today. "Families are needed that do not let themselves be drawn by modern cultural currents inspired by hedonism and relativism, and that are willing to realize their mission in the Church and in society with generous dedication." Amid the applause from those in St. Peter's Square, he quoted Pope John Paul II who described Christian spouses as "authentic 'missionaries' of love and life." 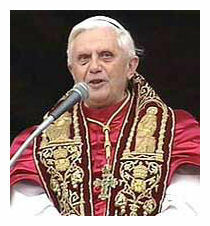 At the same time, Benedict XVI invoked divine assistance for families, "especially those going through difficulties." Speaking in French, after praying the Angelus, the Holy Father appealed to those responsible for public life, to "support, for the good of all, the conjugal and family institution, fundamental for society." Major Catholic publications are showing interest in reviewing Fr. Fox's recent book on masculinity. THE LATEST BOOK BY FATHER ROBERT J. FOX IS RECEIVING ENDORSEMENTS AND GOOD REVIEWS. Before publication the book, “Masculinity: The Gentle Man” - was reviewed by nationally known authors and Catholic Apostolates with favorable recommendations. These included Catholics United for the Faith, Woman of Grace Apostolates, etc. RECENT REQUESTS FOR COPIES OF THE BOOK IN ORDER TO REVIEW IT INCLUDE: The National Catholic Register; First Things magazine with editor Father Richard John Neuhaus ; Crisis magazine; also, William A. Donohue, President of the Catholic League forReligious and Civil Rights for its Journal “Catalyst.” Catholic Family Outreach which distributes tens of thousands of pamphlets across the country has included a picture of the book with information for ordering. Read on for more information on this latest book, greatly needed to be read by both men and women. A request has already come from a major Catholic radio station for an interview. 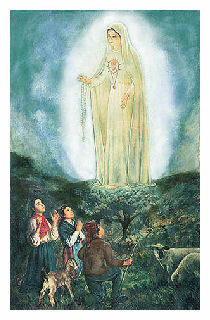 To learn more about the Fatima apparitions, click the title above to visit Fr. Fox's website. Just in case you were still in doubt, The Legion of Mary Blog spells it out for us. 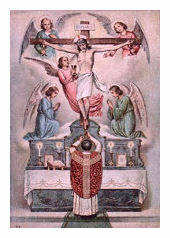 Kneeling at the consecration is not optional for Roman Catholics. If a priest says that you need not kneel, he is sinning. If a bishop says you need not kneel, he is sinning. They have no such authority. Roman Catholics must kneel during the consecration unless prevented by lack of space, health, or another good reason. Not having kneelers is NOT a good reason, nor an excuse. We had a visiting priest celebrate Mass today. As you know, the readings focused on the sacrament and sacredness of marriage. There is no way I can adequately present you with Father B's delivery...keeping in mind he is full of joy and very dynamic. However, he did mentioned quite clearly why these readings prove that allowing priests to marry is not the answer to the priest shortage. A higher percentage of marriages that end up in divorce are a big problem in today's world. Father asked, can you image what the church would do with half of their priests divorced? "You fix the institute of marriage and then we will talk about permitting our priests to be married! "...and he didn't see that happening any time soon. Father made it clear that marriage is a sacrament and is forever. BTW, you'll be happy to know ther lowest rate of divorce, according to Fr. B, occurs in the Catholic Church.